Namibia is a southern Africa country bordered by the Atlantic Ocean to the west and then sharing borders with South Africa, Botswana, Angola and Zambia. Located between the Namib and Kalahari deserts, he country itself is a natural wonder accounting for the least rainfall of any country in sub-Saharan Africa. 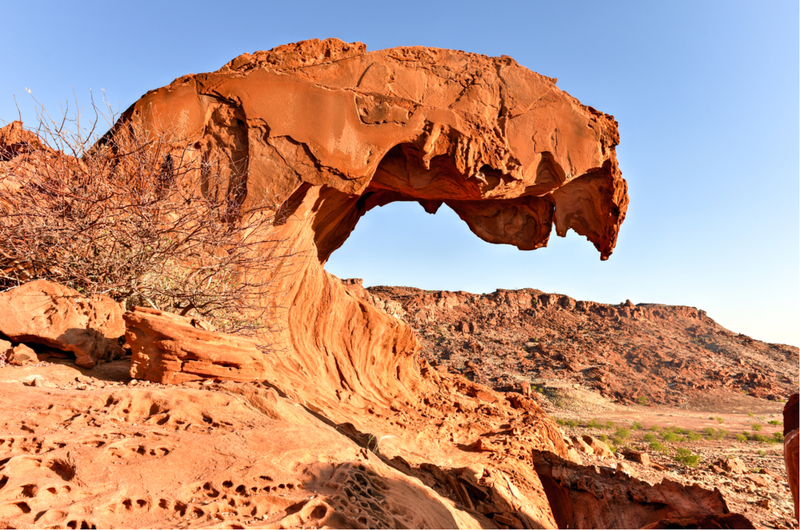 What are the 7 Wonders of Namibia? Nambia is a country that is rich in nature attractions, and it is even home to one of the 7 Natural Wonders of Africa. Take a moment and explore the wonders of Namibia and see why this country should make anyone’s bucket list destinations. Fish River Canyon is the largest canyon in Africa and subsequently has the distinction of being one of the Seven Natural Wonders of Africa. The canyon is located in the south part of Namibia and is one of the country’s leading attractions drawing people to visit the country. 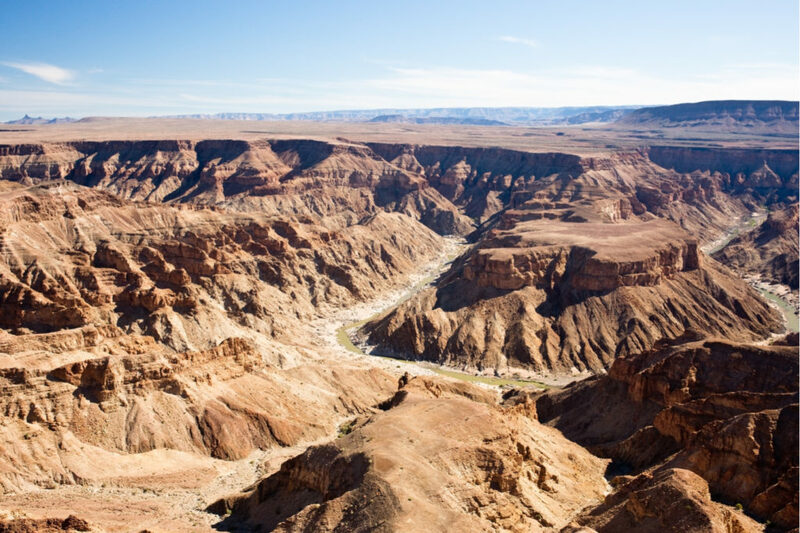 Fish River Canyon is a enormous ravine that extends across Namibia for 100 miles (160 km) with widths up to 16. 7 miles (27 km). It reaches up to a depth of around 1,804 feet (550 m). The rugged terrain and length of the canyon has created a trekkers destination with many people visiting to hike the various trails along the canyon. The source of the canyon is the Fish River which is the longest interior river in Namibia. The canyon encompasses an area of 2,300 square miles (5,900 sq. km). Visitors can look out of the canyon at the Hobas viewpoint. Etosha National Park is located in the northwestern region of Namibia. It is one of the leading attractions for the country. The salt pans are the most significant geological attributes of the park. 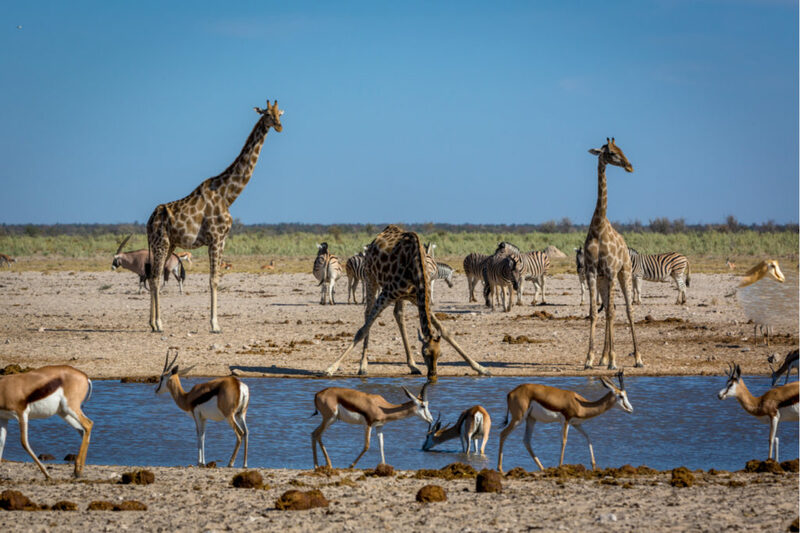 Etosha National Park extends across an area of 8,600 square miles (22,270 sq. km) with the Etosha Pan accounting for 23% of the area at (1,840 square miles (4,760 sq. km). The Etosha Pan is where the name comes from and along with the rest of the park, visitors can hope for wildlife opportunities that include hundreds of species. There are around 114 mammal species, 340 bird species, 110 reptile species, and 16 amphibian species of which many are threatened or endangered such as the black rhino. The African bush elephants of Etosha have short tusks, but they are the tallest elephants of Africa. The Namib is a coastal desert located in southern Africa that measures 1,200 miles (2,000 km) along the coasts of Angola, Namibia, and South Africa. Namib is famous for its sand dunes and unique nature and wildlife encounters. 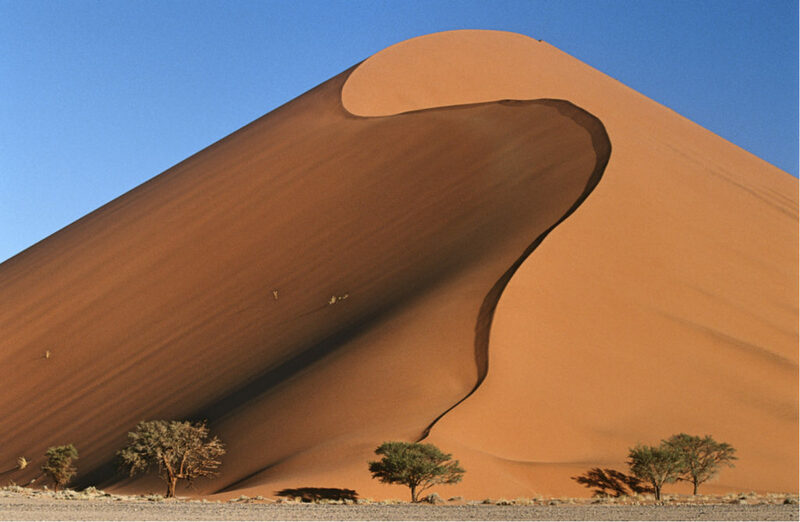 The sand dunes of the Namib reach heights of 980 feet (300 m) making them the largest dunes in all of Africa. They are the second largest dunes in the world. The Namib gets less than 0.39 inches (10 mm) of rain annually. The Namib encompasses 31,300 square miles (80,950 sq. km). The east west width ranges from 30 to 100 miles (48 to 161 km) in width, while the length stretches around 1,000 miles (1,600 km). The coast of Namib also offers a unique experience with lions that hunt seals. Some of the other wildlife include: desert elephant, oryx, ostrich, springbok, jackal, and meerkat. Ruacana Falls is a waterfall located on the Kunene River in the northern region of Namibia. It is the largest waterfall in the country making it easily one of the highlight natural wonders of Namibia. Ruacana Falls stretch across a width of 2,300 feet (700 m) and reaches a height of 390 feet (120 m). 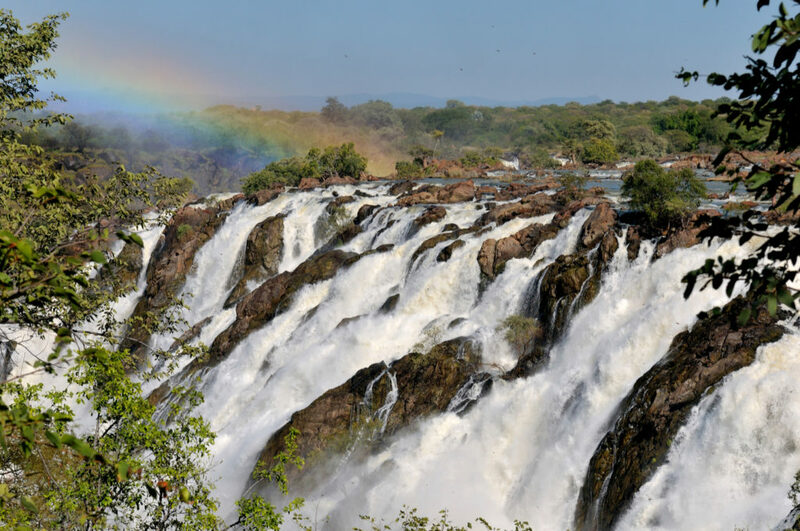 Based on width and volume, the falls is one of the largest waterfalls in Africa. If you follow the Kunene River downstream away from Ruacana Falls about 84 miles (135 km), you can see a second beautiful waterfall with Epupa Falls. Ruacana Falls is the larger of the two and a worthy destination for travelers in Namibia.